I’ve mentioned before that I prefer using hand tools instead of power tools whenever possible. My shop is on the second floor of the house and my band saw lives in the garage. I also usually have a 1/2″ blade on the band saw since I primarily use it for resawing. I use a few frame saws to eliminate the trip to the garage and/or the need to change the blade on the band saw for the occasional curved cut. I started by using a traditional turning saw. This worked well but it was almost a little too much saw for some of the work I was doing. I had tried using a coping saw for the finer work but found the tool to be disappointing. The frame would flex away from the handle and/or I couldn’t get enough tension on the blade. 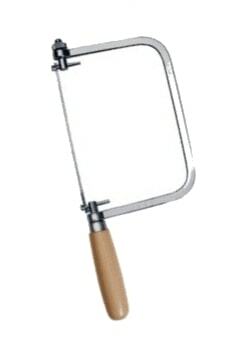 I had read somewhere that the Olson coping saw was more rigid and adjustable than some of it’s competitors. I decided to try one today and was very happy with the results. By using the turning saw and Olson coping saw I was able to easily rough-shape a dulcimer peghead and support block. Some of this requires cutting through 2 inch thick hardwood. 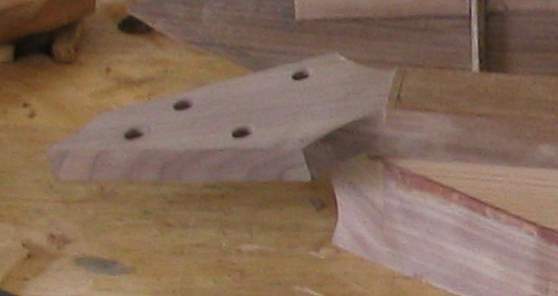 The support block under the peghead is glued to the end of the dulcimer. It is then profiled to match the taper of the sides of the dulcimer. The curve at it’s end is then cut. The surfaces are cleaned and finished with a plane, rasp, file and small scraper. 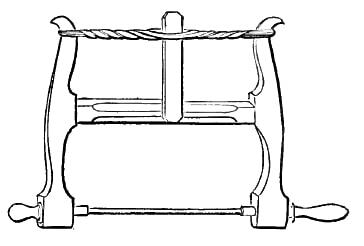 The peghead is made separately and then glued to the sloped top of the support block.